15% off all orders with Weird Fish! 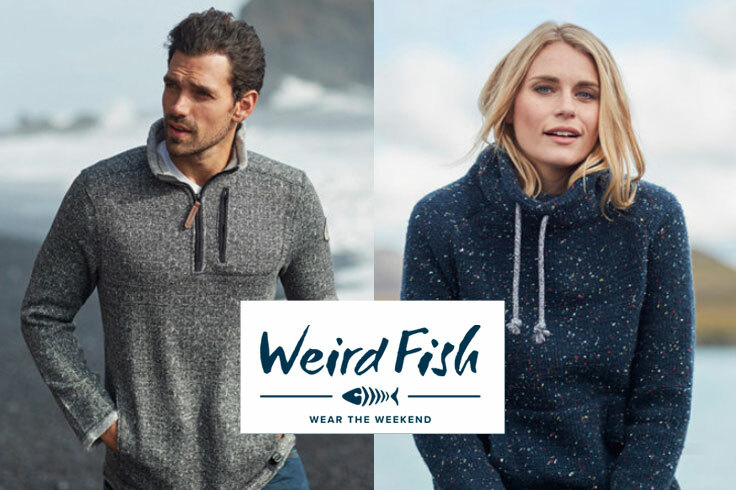 Weird Fish’s relaxed and easy-going clothes are designed to give you that forever-the-weekend feeling. Based in the heart of the rolling Cotswold hills, our company believes in affordable, well-made, and distinctive clothes that instantly become feel-good favourites. Established over 20 years ago, we pride ourselves on our quality and attention to detail. We don’t believe that the weekends are just about Saturday and Sunday; its more about that sense of freedom you get when you escape the daily grind. Our aim is to create relaxed and easy-going clothing that gives you that weekend feeling from the moment you put them on. Through the use of unique fabrics and clever dying and distressing techniques, our clothes come with a pre-grooved, well-loved feel, creating instant feel-good favourites that remind you of the good times. Only ONE (1) promotional code can be used per transaction. This code can be used across all your transaction with www.weirdfish.co.uk and is valid until 30th December 2020. Cannot be used in conjunction with other selective offers.